It is with great pleasure that we welcome you to the premiere issue of Australian Construction Focus. Aimed at leaders in the country’s ever-expanding construction industry, our mandate is simple: to bring you stories about the companies leading the pack, keep you on top of the latest news affecting your industry, and bring you up to date with the newest technology, products, and construction-related events in Australia. For the first issue, we chose as our cover feature the Australian Constructors Association. The focus of the piece is a key issue affecting all of us: workplace safety. Formed in 1994, the ACA represents 19 of the nation’s leading construction contracting organisations, and leads the way in safety. 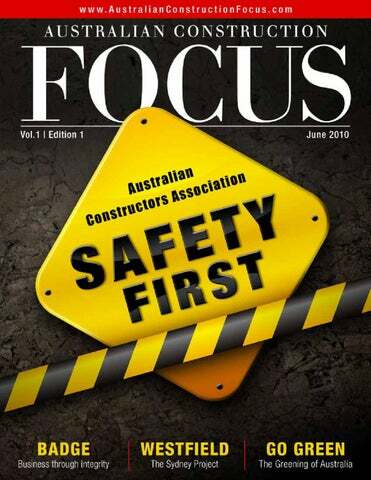 Every month, the digital version of Australian Construction Focus will be distributed free of charge to 12,600 men and women involved in all areas of construction, including senior management, engineers, architects, developers, suppliers, law firms, government agencies, and other supporting industries. In the coming months, we will be publishing a quarterly expanded edition of Australian Construction Focus for you to read, enjoy, and share with your staff and clients. As you read through our magazine, you will discover stories on subjects you may be familiar with, and others that will be new. From road stabilistion to bridge building, you will learn about companies who specialise in construction of aged care centres, build some of the world’s largest shopping malls, and create complexes for poultry processing. No two construction projects are exactly alike, and we will continue to highlight the challenges and triumphs that come with construction in Australia. We look forward to having you along for the journey. Editor’s Pick In this issue, we shine our spotlight on G.E. Shaw & Associates (Pg. 38) and The Westfield Group (Pg. 24). From restoring fire-ravaged buildings at the famous Mount Stromlo observatory to installing a massive, fivetonne magnet at Canberra Hospital used for delicate brain surgery, G.E. Shaw’s projects are anything but commonplace. Working with almost 24,000 retailers across more than 10 million square metres, The Westfield Group is the world’s largest listed retail property group, and behind the massive Westfield Sydney redevelopment, which will be one of the world’s finest shopping destinations. urne in Ararat, prison originally or the centuryis expected to eted in 2012.
erable opposition, a controversial en given the green light. 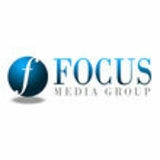 with the companyâ&#x20AC;&#x2122;s efforts that they became valuable repeat clients. In 1990, Badge created their first job for the Catholic Church, along with their first government contract, and began construction on a $350,000 fish factory. It was just one of many multi-million dollar food processing plants the 189 employee-strong company has built over the decades, which encompasses education, defence, health, sports, aged care, retail space, and pubs. All structures have their particular challenges, but few rival food processing, where Badge is one of Australiaâ&#x20AC;&#x2122;s industry leaders. In fact, Badge remains one of only two builders in Australia who are recognised as specialists in the field of food processing. hen it comes to shopping centres, there are malls, and then there are enormous, multilevel glass, marble, and stainless steel edifices that seem more like multi-level, futuristic miniature cities with places to go shopping. Over the years, malls have evolved from places where customers had a choice of a handful of stores to places where they can browse and buy in literally hundreds of shops, all under one roof. Over half a century ago, John Saunders and Frank Lowy opened the Westfield Plaza in Blacktown. Described at the time as being â&#x20AC;&#x153;the most modern American-type combined retail centre,â&#x20AC;? it featured not one but two department stores, a dozen shops, and a supermarket. Although it would be considered small by todayâ&#x20AC;&#x2122;s standards, the centre was nothing less than revolutionary in 1959, and soon became the commercial centre of Blacktown. n every construction project, safety is a priority, and few organisations realize this more than the Australian Constructors Association. Representing 19 of the nation’s leading construction contracting organisations, the ACA is committed to the safety, efficiency, and development of Australia’s ever-expanding construction industry. “Our objective is to serve the interests of Australia’s major construction contractors, so we don’t try and replicate all the services provided by a lot of other construction industry organisations. Our focus is on the needs of major construction companies,” says Jim Barrett, Executive Director of the ACA. The project was nominated for a Master Buildiers Association Award in the demanding category of Projects Exhibiting Technical Difficulty or Innovation. works involved a major civil component, the opportunity was taken to add civil components to the scope of works. cent structural and topping slabs that were allowing water to leak into the underground carpark. cts Exhibiting Technical Difficulty or Innovation. To reduce our carbon footprint, the Green Building Council has seen 220 Green Star certified buildings around Australia; seven years ago, when Green Star was launched, there were none. What, exactly is Green Star? Developed for Australia’s property industry, it serves as a voluntary environmental rating system, evaluating the environmental design and construction of the country’s buildings. Today, 11 per cent of Australia’s commercial office buildings are Green Star certified. says Hardy. This has allowed employees with the appropriate skill sets to work in another department for a time if needed. “We’ve got our core responsibilities, but we’re not necessarily locked into those responsibilities. We can expand as required.” The company has brought their wealth of experience to a number of large mining and construction projects over the years, working on projects for the Barrick Gold Mine, and the Wilpinjong Coal Mine. Along with mining companies, Hardy Bros. have been involved in hard rock crushing for Ulan Coal Mines Limited, and the construction of a number of tailings dams. ‘Tailings’ are large piles of crushed rock that are left behind after metals like gold, silver, copper and lead have been extracted, and they can pose an environmental hazard if left uncontained. For the past decade, Hardy Bros. have been contracted to a number of mines to construct tailing storage facilities, better known simply as dams, to contain the leftover ground-up rocks. Some of Hardy Bros.’s projects include the construction of an irrigation dam for Ulan Coal Mines Limited at Mudgee, and tailings dams for Resource Pacific Limited, and Ashton Coal Operations Limited. To complete the tailings dam for Ashton Coal – located near Singleton, NSW – Hardy Bros. faced a number of challenges, not least of which was the presence of spontaneously combustible areas on the construction site, which required safe work procedures to allow the project to be completed successfully. “Part of our bread and butter is construction of tailing storage facilities,” says Hardy. “When the dam reaches its capacity – basically the water is recovered from the tailings when it is pumped into there – the water gets recycled back through each respective mine.” The construction of these dams is often a massive undertaking, requiring months of work, and specialized equipment for moving tonnes of earth. Big jobs, like the creating of a tailings dam for North Mining Limited, took nine months, and required five, 50-tonne dump trucks, an excavator, and compaction equipment like water carts, compactors, smooth drum rollers, and graders. n the business of construction, skill and using the right tools for the job are important, but so is building and shaping a competitive and prosperous industry through communication between the many interests that make up the construction sector. This is where the Australian Construction Industry Forum comes into the picture. “The most important work that we do is through our construction forecasting council,” says Peter Barda, Executive Director of the Australian Construction Industry Forum. Twice yearly, the ACIF introduce forecasts of demand for housing, non-residential buildings, and engineering construction. A not-forprofit organisation, the ACIF helps promote Australia’s growing construction industry, and offers valuable, free information and data at Construction Forecasting Council, at cfc.ac.com.au. At the site, it is possible to follow building trends, do a historical analysis, and even “Build Your Own Forecasts,” sector by sector, postcode by postcode. There are forecasts for residential buildings, alterations and additions, office and educational buildings, health, aged care, bridges, water, pipelines, and much more. has always been a place where the different interests in the construction industry can come together, discuss issues of mutual interest or concern, and occasionally do some things together that separately they couldn’t do on their own,” says Barda. The many distinguished members of the ACIF’s Board of Directors are representatives from associations and institutions specializing in Australia’s building, engineering, consulting, mechanical, air conditioning, architectural, and fire protection industries, to name a few. ACIF members are Australian building or construction industry associations that have a national structure and focus, and whose principal membership comprises individuals and/or private sector business enterprises in the residential, non-residential, engineering or investment property sectors. any of us drive to and from work every day, often taking the same route over and over again, yet few people notice the condition of the road – unless it is cracked, full of potholes, and urgently needs to be repaired or replaced. The process of road stabilization is not new – the Romans were making roads 2000 years ago, using lime to stabilize the soil – yet the process today requires the expertise of engineers, surveyors, and many others to ensure roads are properly graded, physically stable, and constructed to endure years of wear and tear. When it comes to creating new roads and repairing existing ones, many choose Stabilised Pavements, a leader in the industry, and the largest specialist stabilisation contractor in Australasia. few other different additives that are available,” says Stabilised’s General Manager David Berg, “By basically compacting – putting it back down, and putting another service on it – the road is good for another 20 or 30 years by utilizing the materials that are already there.” Instead of trucking in or hauling away expensive materials associated with traditional road construction, recycling existing roads greatly helps Mother Nature, and keeps costs down. A highly experienced stabilisation manager responsible for over 20 crews working in a wide range of stabilisation and recycling projects, Berg says the cost of road recycling is often 30 to 50 per cent less than conventional construction work. treatment of new and recycled materials, Stabilised Pavements operates one of the world’s largest, most modern fleets of in situ stabilisation and recycling equipment. With its head office in Australia, Stabilised Pavements International has operations in the United Kingdom, Malaysia, Brunei, and Indonesia. Their many clients include State Government Road Authorities, Local Government Authorities, and private contractors throughout most States and Territories of Australia. They will often work alongside local partners, around the world, on projects large and small, and even in remote areas. They have been involved with many road upgrades, with one of the largest being the M4 Motorway upgrade. – and soon expanded into multi-million dollar construction and maintenance contracts across all market sectors in New South Wales. In 2003, the Hanlons retired from the business, with the O’Donnell family taking full ownership of the company, which is successfully managed by the second generation of the O’Donnell family. Today, O’Donnell & Hanlon is a company with two major divisions, Construction, and Maintenance. With their head office based in Kempsey, New South Wales, they also have branch locations in Coffs Harbour, Goonellabah, and Tamworth for their asset maintenance services. O’Donnell & Hanlon’s Construction Division often carries out a wide variety of commercial projects valued up to $15 million, including both construct only, and design and construct projects in many areas. We know your area so we can make sure you’re covered for local conditions and circumstances. On most policies we can roll all your insurance into one package with one renewal notice and one expiry date with pay by the month for no extra areacharge. And in many cases we can handle your claim locally. For a range of covers for your farm, business, house & more please call 13 LOCAL (13 5622) to connect directly with your local agent. is another way the company is building future business partnerships, much like the two founders did when they joined forces back in the Seventies. Elders Insurance Limited and other insurers issue these insurance products. Product Disclosure Statements are available from Elders Insurance Limited and your local Elders Insurance authorised representative. You should consider the Product Disclosure Statements in deciding whether to acquire, or to continue to hold, the products. Elders Insurance Limited AFSL 237756, Head Office: 27 Currie Street, Adelaide SA 5000.